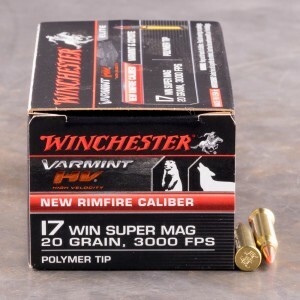 17 Winchester Super Magnum ammo is a very young rimfire cartridge, introduced in 2012, and features a very unique design. The majority of 17 caliber rounds were based off of 22 caliber rounds including the 223, the 221, and the 22 Long rifle. However this 17 Super Magnum is a bit different. The cartridge is actually based around a 27 caliber nail gun blank, and the cartridge was necked down for the smaller 17 caliber bullet. The cartridge can be described as a bottle necked, rimfire, 17 caliber cartridge. 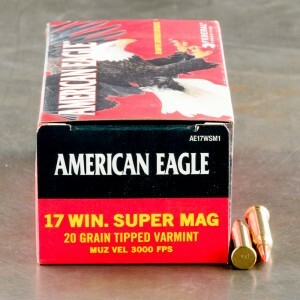 Federal American eagle 20 gr. polymer tip ammo The first time I used these I put 3 of them into 1/2 inch @ 100 yards.You might not think that to be unusual,but my new ruger was delivered with a trigger closer to 6# then it was to 5.Since attending to that I have one group of three under .300...ok so it's accurate.Lets talk about field performance.Ground squirrels were traumatically disassembled as though hit w/223.Hits were recorded out to 200 yards.What WAS unusual was that virtually ANY hit anywhere on the torso would kill almost immediately by shock...a 22 hit there would send them running!